Brilliantly funny new series about the bravest scaredy-cat in the worldSam Wu is NOT a scaredy-cat (except he is). When a trip to the Space Museum goes terrifyingly wrong, Sam begins a mission to prove to the school bully, and all of his friends, that he is a fearless space adventurer. A truly laugh-out-loud, voice-led and madcap story of ghost hunting, snakes and mischievous pet cats called Butterbutt, perfect for fans of Tom Gates, Wilf the Mighty Worrier and Barry Loser, and readers aged six plus. Look out for Sam's jawsome follow-up adventure - Sam Wu is Not Afraid of Sharks! coming in July 2018. Katie and Kevin Tsang met in in 2008 while studying at the Chinese University of Hong Kong. Since then they have lived on three different continents and travelled to over 40 countries together. In 2015 they got married in Palm Springs, California. Kevin was born in Copenhagen and grew up in Atlanta, Georgia. Some of Sam Wu's experiences are based on Kevin's childhood. He currently works as a healthcare technology consultant. Katie was born and raised in Southern California and also writes YA as Katherine Webber. Katie and Kevin currently live in London. 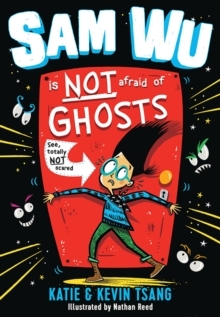 Sam Wu is NOT Afraid of Ghosts is their first joint novel.